This week the DEC announced its plan to completely eliminate mute swans in New York State by the year 2025. The New York State Department of Environmental Protection's draft Management Plan for Mute Swans in New York State is available online. Killing New York’s mute swans and other wildlife is wrong – it is cruel, and not how New Yorkers want our taxpayer dollars spent. The rationales used to support killing these animals are deeply flawed. New Yorkers value our wildlife, and cherish the free-living animals we share our environment with. We believe these creatures should be protected, not slaughtered. This draft management plan supports actions by DEC to eliminate free-ranging mute swans from New York by 2025. 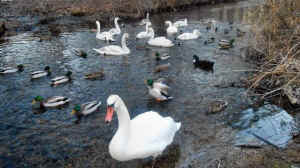 Comments on the draft mute swan plan may be submitted in writing through January 31, 2014. Also read Invasive Swans or Infected Journalism? The DEC recently released its proposed ten-year management plan for the Mute Swan in New York state. This outline for management seeks complete and total decimation of the species by the year 2025. One of the top reasons the agency gives for this policy proposal is the Mute Swans “exhibiting aggressive behavior towards people.” Swan attacks resulting in serious injury to humans are so rare and near physically impossible that the government insults the public's intelligence by presenting this as a major justification for extermination. If you approach a swan nest they might get aggressive and hiss and flap their wings to protect their young, but the danger that they will break your leg or arm with their wings is pure baloney; it's cheaply packaged propaganda for public consumption. They are not that strong and it's all show and bluster. Any serious injuries that have been documented are nearly without exception a secondary result of entanglement, such as falling or drowning. The agency gives further justification for utter eradication by stating that the “mute swan is a non-native, invasive species brought to North America from Eurasia for ornamental purposes in the late 1800s.” How long must a species inhabit a land before it can rightly call it home? Perhaps one can seek clarification and gain perspective on this from the Native American population. Furthermore, the words “for ornamental purposes” in the agency's argument is lacking and clumsy at best; at worst, it's the voice of a gestapo; a soul-less machine. Mute Swans were brought here because they are beautiful. Yes, that's true. And that's a perfectly valid reason! For many of us, the natural world's beauty is profound inspiration and points toward a greater intelligence or spirit to which we can all aspire toward. And it is never a reason to destroy. The New York State Department of Environmental Conservation's case against the Mute Swan falls flat in the face of reason and responsibility. Its plan to utterly eliminate this majestic creature from the face of its land reflects an agency that has lost touch with its core mission as well as with the greater voices to which it must ultimately answer. Their plan's pathetic attempt at simplifying or reducing management to utter elimination of what's to be managed is a dereliction of duty and a crime against nature and public trust and a very grave cause for concern.